More than 250,000 copies sold! A creative writer’s shelf should hold at least three essential books: a dictionary, a style guide, and Writing Fiction. 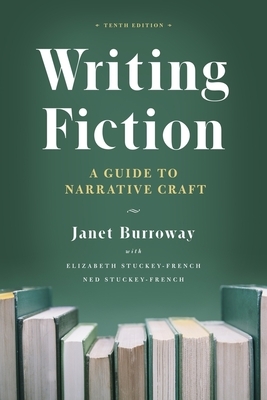 Janet Burroway’s best-selling classic is the most widely used creative writing text in America, and for more than three decades it has helped hundreds of thousands of students learn the craft. Now in its tenth edition, Writing Fiction is more accessible than ever for writers of all levels—inside or outside the classroom. This new edition continues to provide advice that is practical, comprehensive, and flexible. Burroway’s tone is personal and nonprescriptive, welcoming learning writers into the community of practiced storytellers. Moving from freewriting to final revision, the book addresses “showing not telling,” characterization, dialogue, atmosphere, plot, imagery, and point of view. It includes new topics and writing prompts, and each chapter now ends with a list of recommended readings that exemplify the craft elements discussed, allowing for further study. And the examples and quotations throughout the book feature a wide and diverse range of today’s best and best-known creators of both novels and short stories. This book is a master class in creative writing that also calls on us to renew our love of storytelling and celebrate the skill of writing well. There is a very good chance that one of your favorite authors learned the craft with Writing Fiction. And who knows what future favorite will get her start reading this edition? Janet Burroway is the author of plays, poetry, children’s books, and eight novels, including The Buzzards, Raw Silk, Opening Nights, Cutting Stone, and Bridge of Sand. Her collection of essays, A Story Larger Than My Own, was also published by the University of Chicago Press. She is Robert O. Lawton Distinguished Professor Emerita at Florida State University. She lives in Chicago and Lake Geneva, Wisconsin.